As a wordpress plugin developer for the Google Custom Search plugin, I get a lot of queries from users having problems with the plugin. The most common query I get is “I’ve installed your plugin last year, but recently it stopped working. Can you help me?”. I normally take a 3 step approach to diagnosing wordpress plugin problem, but before we get to that, let’s look at why a plugin might have stopped working. You might have upgraded your wordpress installation to a newer release. WordPress releases fix/updates and upgrades regularly and the new version might not be compatible with the plugin. This is usually the of most plugin problems where the code in one of your other plugins conflicts with the code in the plugin in question. JQuery conflicts is common cause. The new version of the plugin is Broken! While very uncommon, it can happen. The developer writing the plugin made some changes which has broken the plugin. This might be the case if you have recently updated the plugin. Normally for this situation, you can expect a new update to be available relatively soon with the fixes. Disable all plugins except for the one which is broken and check that the plugin now works (if it doesn’t proceed to the Step 2). Next activate the plugins one at a time until the plugin in question stops working. The last plugin which was activated is having a conflict with the plugin which you are diagnosing. Switch wordpress theme to the default “Twenty Eleven” Theme. Check if the plugin in question now works. If it does, then the theme which you have is in conflict with the plugin. If the first two steps did not diagnose the problem, then you need to use Firefox‘s Error Console to see what the plugin error is. Open the Error Console in a Firefox browser using the shortcut key Cltr-Shift-J. From there you might be able to identify what the error is which is causing the plugin to not work. Once you have found the problem, what can you do to fix it? If it is a conflict with another plugin or theme, then you might want to contact the developer of that plugin or theme to get them to put a fix in. If you did Step 3 and have the error message from Firefox Error Console, sending the error messages to the developers will help them with providing a fix. 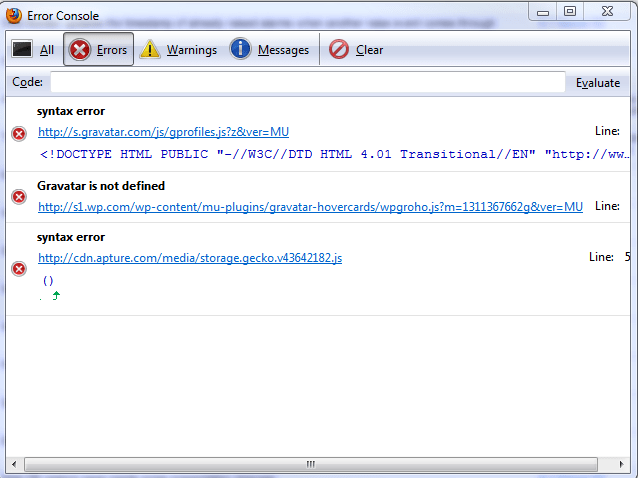 What I find is that you get a faster response from the developer when you include the error message. The other alternative, is now that you have identified the culprit, you can choose to not use that plugin or theme and find an alternative. Often times, there are multiple plugins providing similar functionality. You just need to search for them at http://wordpress.org/extend/plugins/. Hi Edwin, I have an unusual problem. I have two sites listed for the search in my site outerregion.hackinghistory.ca and only am getting results from one. Have this ever happened before? Might this be that the other site is outerregion.ca and the names are similar? It could be due to the settings you had for the custom google search. Did you create separate search engines at http://www.google.com/cse/manage/all and have different included sites setup on each of them? How to place this plugin in nav bar instead of sidebar.? To work in the nav bar the plugin has to be activated in the sidebar too, but i dont want to display the plugin in the side bar. Please help. hi, thanks for this very nice and interesting post. 🙂 I like your writing style, it’s quite unique.